Do they look content, or what? The kittens are up and moving. They are soooo cute! The mischief is beginning though. I think he is even smiling. To dream of a black cat is lucky. To dream of a tortoiseshell cat means luck in love. also mean the birth of a child. To dream of a tabby cat means luck for the home and all who live there. To dream of a grey cat means to be guided by your dreams. A dream of two cats fighting means illness or a quarrel. Well, the pictures didn't come out like I had hoped. These 3 are one window sill in my kitchen. I collect this old colored glass and when the sun shines in, it's gorgeous. Unfortunately, we don't see a lot of sunshine, these days! (Expecting 4 more inches of rain today!) Some of the glass came from mom , some from yard sales and a couple pieces Mori found for me! I love them. By accident, I started to put all my found nature-y type things here and it just made sense to become the alter. I have the sea shells I found in some containers, tiny mermaids, robin's eggs, my corn dolly and fairy house. Crystals the kids made and forgive the ripening tomatoes... but I guess that works for Lammas too! Hey Mori, look what I found. Isn't it funny how we're finding the same goodies? 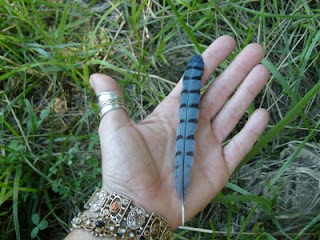 My blue jay feather is a bit mangier though, oh well! I looked up feather magick. I love this list. Blue Jay feathers are valued as bringer of light and joy and are said to have the ability to brighten up even the darkest places. 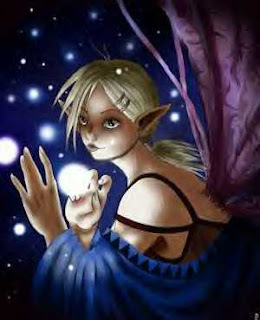 Finding faeries, while faeries abide everywhere in nature. Some places are just more magickal then others, some places are more faerie freindly,there are those hidden out of the way places that faeries are just drawn to. I believe the deep hidden creek banks behind our land to be one of those very magickal places. 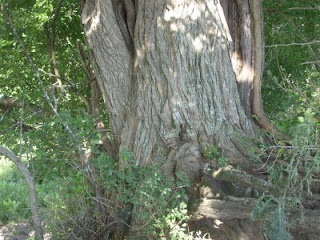 Even within the bounderies of these creeks, some places are more magickal feeling then others, I am drawn to one tree more then another, or one area more then another. as I walk along, I follow that inner feeling of magick, and listen to the chatter on the wind, sometimes I will notice tiny sparkles catching my eye, dancing in the shadows. I love photograhing these areas, the area of the base of huge trees, I can image tiny faeries villages all around. I can feel the faerie folk there. I know they have amazing homes in the base of these trees. 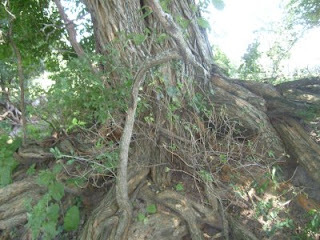 With their twisted gnarly root system, and huge plants growing all around. It creates the perfect enivornment to keep the fey safe and happy! 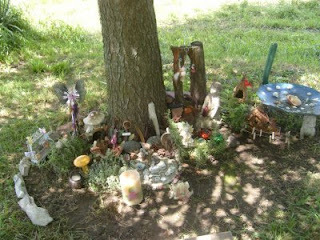 I call this place my private little Faerie Hallow, even though I have a faerie garden in my own yard, I also leave tiny blessings here, and I go here for guidance and fey meditations, and some times just to visit, and renew my "knowing" they are all around! Come away, O human child!To the waters and the wildWith a faery hand in hand,For the world's more full of weeping than you can understand.~William Butler Yeats, "The Stolen Child"
I made this little fairy house at the beginning of the summer. It was a lot of fun. 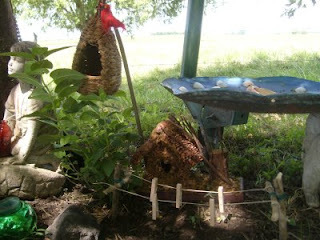 I used a small bird house from the dollar store and covered it with bark and pine cone pieces, sticks and a sea shell. It was fun and looks real sweet! I still would like to make a second using white birch. I keep this on my window alter for the house fae to use. I'm not sure that it would hold up in the weather outdoors. Also, I noticed 2 more fairy rings outside! I just figured I'd do a little house blessing for it! Fairies and Pixies, elves and gnomes. Spinning some magic, spells for our homes. Their wishes are happy, of joys to share. Join in their revelry, if only you dare. Sending you Magick, to store in your heart. Just a glimse of this amazing blue butterfly set my heart sailing into the summer wind, I love it when I'm walking along and something catches my eye, it makes me pause, and enjoy the magickal energy of the nature around me. I find that magick is not so far away, hidden in some locked up vault that we have to tap our way into.. true magick is in the everyday living & loving of our world around us, blending our energy with that of nature, to create just what we need & want from life. 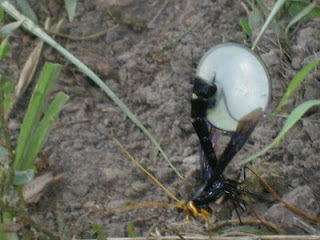 Another treasure from our walk was the sght of this wasp! 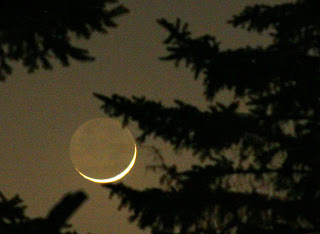 I had to come home and look up what excatly I had taken a picture of! I had never seen such a thing, its acutally a Megarhyssa atrata ovipositing, now those are some big words, so I had to again look them up, so after some time I figure out I took a picture of a gaint wasp laying eggs, or something close to that anyway. In some African traditions, the wasp is a symbol of evolution, and control over our life circumstances. Some Native American Indian tribal myth inidcates the wasp as the creator of the earth, and was a symbol of order, organization as well as productivity. Ancient European lore recognizes the wasp as big part in pollination. Here the wasp is symbolic of fertility as this genre of earth-based believers honored the wasp for its role in continuation of certain plants and flowers. The prime season of the wasp is spring, and so it is symbolic of new beginnings, and starting new projects. The wasp is very social, and has special means of communication with its family. When the wasp appears in our lives it is a message for us to consider our own methods of communication. The wasp might be a sign that we may need to express ourselves more clearly. "Are all my affairs in order?" "Am I aligning myself with my goals?" "Am I procrastinating about something?" "Am I keeping myself from reaching my highest potential?" "Am I allowing my progress to be held back by others?" Those with the wasp as their totem may learn more by asking these questions of themselves, and calling upon the wasp for more clarification too. Wasps are perfect totems for those of us who need a bit of organized focus, and assistance with assertive communication. The wasp can also help in areas of building, whether it be a new home, or building on a dream - the wasp is a master architect and can guide you with the planning of any building project you have in mind. This is just a glimse of the tiny treasure from our evening walk on our land! I was wondering what I'd like to do for Lammas this year, I am just not ready to welcome fall, and I'm really enjoying this summer weather! its so amazingly cool for July. So I decided to make a little treat for the birds to enjoy later on this winter. 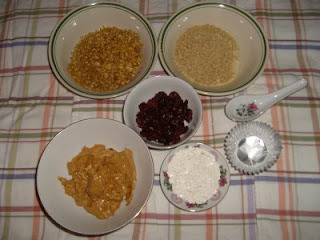 crush cheerios, soy nuts, dried cranberries, and a small amount of crushed egg shells. 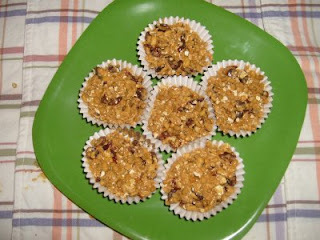 fill tiny muffin tins, and place in freezer until ready to use. I also have some left overly well done apples, I think I will slice them and hang up to dry as well. We took a walk tonight, just a 1/2 mile down the road. It's steamy out there and rains on and off. I'm feeling like I live in a tropical rain forest these days! When we got to this pond or quarry, I'm not really sure what it is, we could hear the frogs talking and then hear all the ker-plunks as they jumped in to get away from us. The reeds and cattails were so pretty in the heavy air. The rest of the area is rocky. Along the way we passed by some puddles that were filled with tadpoles. So I thought I'd take a look at their totem meaning. Frog's song calls down the cleansing power of the rain. Frog is a reminder of the sacred power of tears to transform and cleanse away sorrow. Frogs will die if away from moisture for too long, and thus Frog reminds us to refresh ourselves, and allow joy to moisten our lives and our hearts. If you are feeling "muddied" by the world, take a moment to dream, to laugh and cry and renew yourself. It is imperative to learn how to recognize when people, situations and circumstances are draining energy, and to cleanse them out of your aura so that you may sing freely. I saved my corn husks and made a corn dolly. It was fun! I tied her with green ribbons from Mori with thoughts of prosperity going through my head! She is now sitting in my window sill alter drying and will be picking up the rays of the moon as it grows into full. And keep or home illness free. Toto, I've a feeling we're not in Kansas any more. 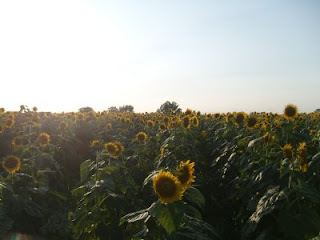 Being born a down home kansas girl, I love sunflowers. They remind me of home, and of my dad.... But more and More they are growing in huge fields here in Missouri. I love the sight of them covering fields all the way to the horizon! dancing in the wind with their faces all aglow! 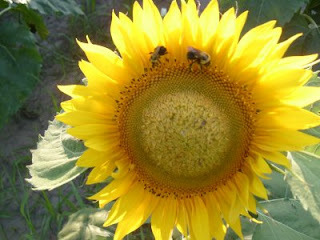 Its also a welcomed sight to see the bee's that still swarm to the bright yellow blooms. I realized that I had taken a lot of pictures of rocks lately, they have been jumping out at me. I got thinking of those long skinny stones from the other day and I really wanted to find a meaning. I wasn't looking for phallic to be that meaning though .....but I found this list of stone shape meanings. I have a little bit of everything here. up and through the stone to bring you prosperity. part of the body it resembles. are worn or carried for this purpose. relationship you are in true. And can be used to bring a self love . Symbolize the Earth, Prosperity ,and abundance. to bring added power to the spell. While I was walking on the Hudson the other day, I saw many sculptures had been added all over. This was one of them titled Three Sisters. I'm not sure of the artist. It is made of beautiful bark pots. One pot is filled with corn, one with beans and the other with squash. Erney, Diana. 1996. Long live the Three Sisters. Organic Gardening. November. p. 37-40. The term “Three Sisters” emerged from the Iroquois creation myth. It was said that the earth began when “Sky Woman” who lived in the upper world peered through a hole in the sky and fell through to an endless sea. The animals saw her coming, so they took the soil from the bottom of the sea and spread it onto the back of a giant turtle to provide a safe place for her to land. This “Turtle Island” is now what we call North America. I chose this story because the Iroquois are from NY but another legend is also here. The sweet smell of honeysuckle fills the air, growing outside my kitchen window. 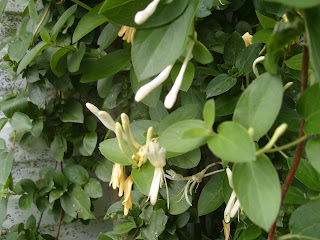 The Honeysuckle encourages us to reach for those desires sought while remaining true to the values and beliefs held. The Honeysuckle will help you to tread safely. The sweet scent of the Honeysuckle signals joy in the search for the self. The other day I was trying to sit outside and enjoy the weather, since it was finally not raining! I was doing some reading and lasted about 5 minutes. The mosquitoes were just too much for me. Then a sad thought occurred. It's been quite awhile since I've seen many bats. There used to be so many outside I would almost have to duck! It seems the bat situation is worsening. I have found some plastic bats the boys had and hung them in my special wish tree along with my bells from Mori, my favorite chimes and ribbons from past spells and sabbats. I'm wishing for the bats to come back and sending them out a blessing. for all that must be put to sleep. I can't believe how time flies! Lammas is here in less than 2 weeks! How will you celebrate? I read lists of activities and some are just too Autumn-y for me. So, here is my list of activities, that I hope to accomplish. Some of them I already have! Gather flowers and leave them as an offering to the sun god, or the fairies. Have a magical picnic and break bread with friends. Decorate the altar and house. 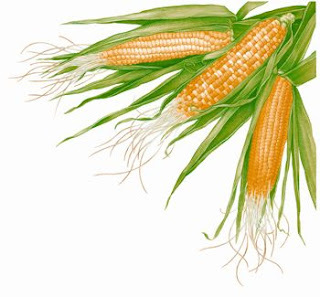 What's on your Lammas list? I'll share what I accomplish! I started this spring with an idea, and a memorial spot for my son, his picture has been moved to the side of the road, the sight of his death, but in its place, magick has grown! today I added the tiny faerie clothes line, and tiny natural faerie hut, as well the hanging natural basket, I thought it would make the perfect faerie nursery! this was an old iron photo frame, one of this week-ends garage sale finds! I took green hemp string and filled the back where the picture goes with a spiderweb creating a faerie gateway! 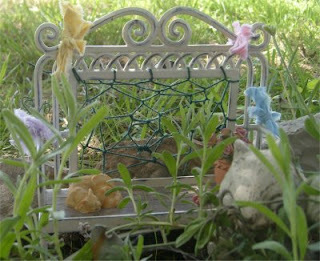 added some little rag ribbons and there's my new faerie bench for the edge of the garden! This shows just how much the garden has grown under my sacred tree!, I'm collecting things as I go along, rocks here and there that I find, lots of goodies to many to speak of of, hidden in every nook and cranny! Combine sugar and oil, add vitamin e, e.o's and herbs. Mix up. Keep in jar. Sugar is good for really dry spots. I have actually been using this on my heels, hands and elbows. My heels are so dry from flip flop weather and I think this helps. Also, the rose geranium is supposed to keep ticks away, which is why I bought the stuff. We have so many ticks around here and Lyme's Disease is really getting out of hand. Maybe this might help to keep those nasty things off my ankles! We took a short walk on Friday to one of our favorite swimming holes. It was a little on the too cold side, but it was a nice break. On the way back up the trail. I noticed Indian Pipe growing. I always thought this was so cool! I always thought it was a fungus too, but it is actually a flower. It is known by so many names that I had a difficult time finding much magickal information on it. I found the most info by one of it's names- elecampane here ( The site is difficult to read though) and here. Elecampane is magickally used for banishing and to dispel angry or violent vibrations. Associated with elves. Use in a sachet to attract love or in incense to purify initiates. Strong association with the Elven world and Tarot. Useful for baby blessings. Hide a sachet of elecampane or sprinkle it around doorways to keep out bad vibrations. Ground together with vervain and mistletoe for a powerful love powder. Worn, elecampane attracts love- Sew up some of the leaves or flowers in pink cloth, or make a sachet. It is also carried for protection, and the herb smoldered on charcoal aids in sharpening psychic powers, particularly when scrying. 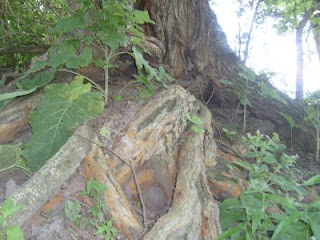 As you would guess there is also a Cherokee legend that goes along with the plant. It says where ever you see a grouping, there has been an argument in the past and the indian pipes are to remind us to live in peace. I've always believed that, part of really being a witch is getting out and about, and enjoying nature. One can only read so many books, or websites, but the real learning comes from living, living the life of a witch. By experience! Nature alone is a wonderful teacher, listen to her gentle messages, and she will fill your heart with faith that magick is all around. Last night along with the joy of watching the great blue heron fish, I also took the time to walk, I found so many treasures, I find it amazing that even though we are hundreds of miles apart, my walk was filled with many of the same treasures as carol's. 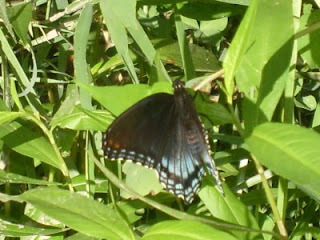 The sight of cattails, and blackberries, along with fields full of bee balm all a bloom. 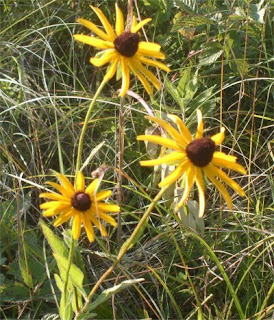 One of my favorite things of this time of year is the brightly colored black eyed susan! magickally speaking the black eyed susan is connected to the Sun, and powers of protection! The Legend of Black-eyed Susan and Sweet William(Rudbeckia hirta and Dianthus barbatus) These two much-loved wildflowers have a romantic legend in common, told in an old English poem by John Gay: “All in the downs the fleet was moored, banners waving in the wind. When Black-eyed Susan came aboard, and eyed the burly men. ‘Tell me ye sailors, tell me true, if my Sweet William sails with you.’” This search for Sweet William is one of the all-time favorite wildflower legends, and good gardeners always note that these two species are both biennials, bloom at exactly the same time, and look lovely together. Last night we went to the lake for my husband to do some fishing, and for me to spend some quiet time, watching nature. 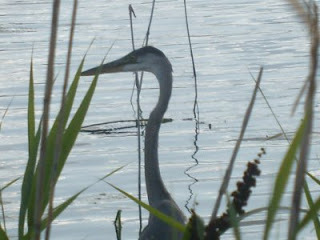 I spied a great blue heron, fishing along side the bank. it was amazing! I took a ton of pictures, and he allowed me to get really close without a worry in the world as he went about his evening meal. I always take those precious moments in life, ans signs and messages. so I look up some heron information. The heron is part of the family of birds known as "waders". They live and feed in marshlands and in shallow waters, and are often confused with cranes and storks. 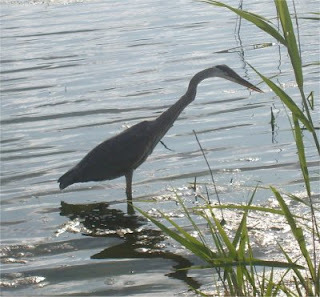 The heron carries a strong message, and it takes a very special person to live with heron medicine. You are strong and aggressive, determine your own course in life and rely upon yourself. You find a comfortable balance in the "shifting sands" of life for you are able to see opportunity where many would not look twice. You know what is best for you, and have the courage to follow your own path. You are a person who does not need the security of a 9 to 5 job, pension plan, group insurance and the assurance that every day will be the same. You are one of those rare breeds that can live on the razor's edge of life, and have an in-born instinct about what will and what won't work for you. You are happiest when you are exploring many things, learning many skills, and are often known as a "jack of all trades". While this may give the impression that you are flighty and irresponsible, quite the opposite is true. If one thing fails you, you have an assortment of knowledge and skills to fall back on. You are never without, and adapt into new working situations with ease. Herb Robert- part of the geranium family. This one I will research more, because it seems so interesting. It's even planted in the "magic" garden section of the medieval gardens of The Cloisters. It's good for love, protection and increases the power of other herbs. It's also known as Dragon Blood red. Pine- prosperity. Burn for strength and to rid negative energies. The scent will alleviate guilt. Guess what I'm doing tonight:) Isn't this tree gorgeous, it's so soft and almost furry looking. They all were. Blueberry-protection. This was a very nice find. We munched along the road all the way there!